This is a very easy and inexpensive way to conduct the single-photon detection experiments of the book’s Chapter 2, as well as the Compton Scattering experiment in Chapter 5. The setup makes for a great general-purpose radiation spectrometer for the identification of gamma-emmiting isotopes. This is easy! Simply connect the oscilloscope probe that came with the DSO201 to the PMT probe’s output. Set the probe to X1. You may want to build a dedicated MCX-to-BNC cable to make this connection more suitable for field use. 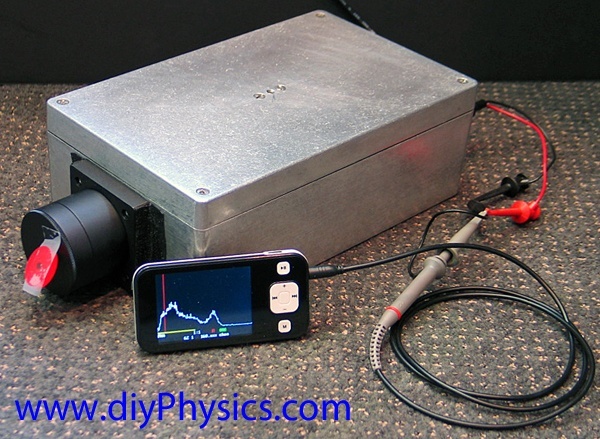 Connect your PMT/NaI(Tl) scintillation probe to the oscilloscope. Place a Cs-137 check source close to the crystal. Power the probe (+1,250V) and tune the probe’s gain so that it produces negative-going pulses with a maximum amplitude of around 3V. If you built the probe exactly as shown in the book’s Figure 30, then the pulse width should be around 12 microseconds. Otherwise, you may need to add a simple RC low-pass filter to stretch the PMT pulses to be at least 6 microseconds wide. 1. Download the zipped file for the latest GammaGrapher V2 release from https://sourceforge.net/projects/gammagrapherv2/. Unzip the file into its own folder. 2. 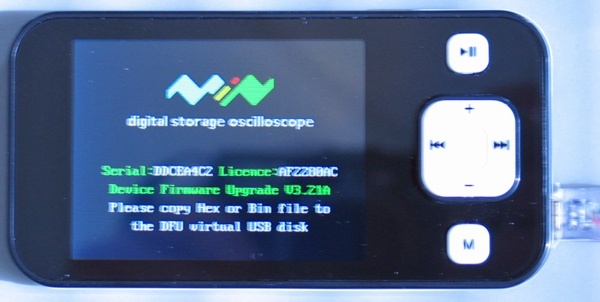 Connect the DSO201 oscilloscope to your Windows PC via the USB cable that comes included with the DSO201. 4. An Explorer window for the DSO201’s directory should open on your Windows PC, as if you would have connected a USB drive. Its name will be something like “”DFU V3_11_A”. 5. 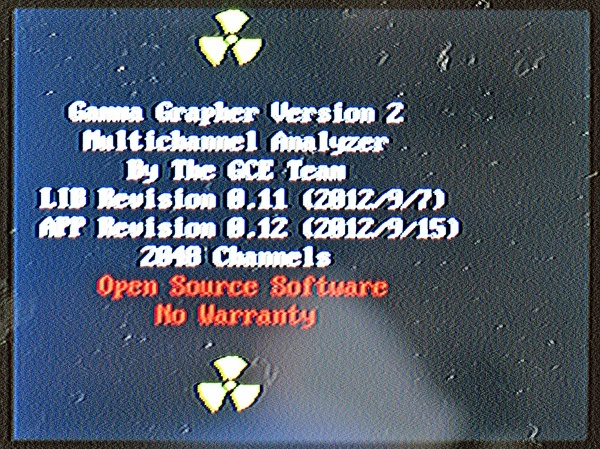 Copy the file mca-app.hex from the \GGV2_APP\project\gcc\ directory in the folder that you created by unzipping the GammaGrapher .zip file into the DSO201’s directory. The DSO201’s Explorer window will close, and after a few seconds reopen to show the mca-app file with its extension renamed to .rdy. 6. Now copy the file mca-lib.hex from the \GGV2\GGV2_LIB\project\gcc\ directory in the folder that you created by unzipping the GammaGrapher .zip file into the DSO201’s directory. The DSO201’s Explorer window will close, and after a few seconds reopen to show the mca-lib file with its extension renamed to .rdy. 7. Turn off the DSO201, and then turn it back on. GammaGrapher’s welcome screen will be displayed. Congratulations! You now have a $79 Multichannel analyzer! To access the design files (and hopefully to participate in the development) you will need to join the GammaSpectrometry Yahoo Group (free membership). 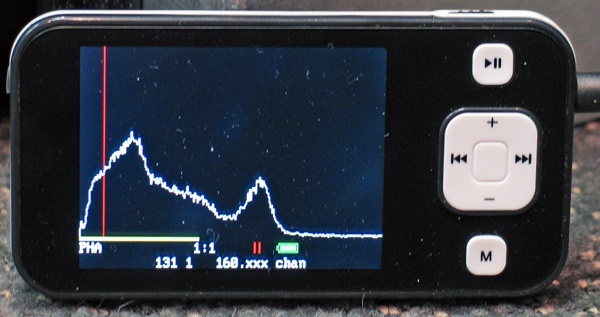 Join through: http://groups.yahoo.com/ Read the posts and experiment with calibrating your probe to yield high-resolution spectra that reads correctly in keV. That is so awesome! It would cost thousands to get a pro portable mca to match that! Just one question: Any ideas about good portable HV power supplies that would be suited to this application? can we do the same for photon counting?